The Louisville series, newly revivified, confirms once more how the many commissions, first performances and recordings fed into the stratum of twentieth century music-making. This Malipiero disc reinforces the point. It’s inevitable given this focus that single composer discs will throw up timings that by current standards one would find unacceptable. This one, for instance, runs forty-nine minutes. Nevertheless the whole nature of the endeavour is such that collectors will want these recordings irrespective of timing considerations, so well has the work been accomplished. 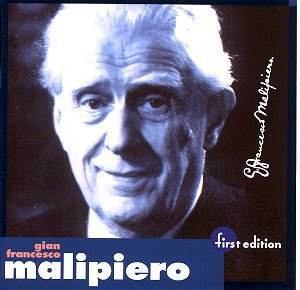 Malipiero was commissioned by Louisville for the Fantasie and the Concerto. All three pieces however received premiere recordings under the orchestra under Robert Whitney between 1954 and 1966. The Fantasie di Ogni Giorni – Fantasies of Every Day - opens gently with some distinctly Bergian refractions; gathering pace from around 4:40 the writing becomes more loquacious and brassy, with feints towards fugato and a deal of dissonant traffic. It’s a kind of day journal-fantasy though it seems perfectly explicable – if not always likeable – on first hearing merely as a passage from quietude to drama. Benjamin Owen plays the Third Piano Concerto, a three-movement work that seems to cleave to the model of anti-heroic, vaguely neo-classical diatonic. The soloist has plenty of pliant rather withdrawn chording but the strings don’t take advantage of their opportunities – limited it’s true – to sing out. In the central tableau we find things rather static. A pregnant gravity infiltrates, then more overtly romantic writing. The finale offers far more opportunities for conventional display but Malipiero also serves up some more neo-baroque reflectiveness as well. It all ends decisively “up in the air.” Rather a hard work to get to terms with – not so much its narrative continuity so much as what really lies behind it. Finally there’s Notturno di Canti e Balli (Nocturne of Songs and Dances), written in 1957. One senses something programmatic here but again Malipiero remains austerely aloof. March rhythms make an appearance in the first movement. The second, effectively a Scherzo, contains some odd hints of mortality amidst the big-boned writing. Any romanticised gestures by the strings in the slow movement are cut away by the intercession of brass and wind. And for all the chattering and perky dance rhythms of the finale – chuckling bassoon, solo for the violin – there’s a slightly manic air over the whole thing. Malipiero masks himself well here; the performances are good but occasionally strained in the Fantasie and in parts of the Notturno. Don’t be put off by such small details however. These are pioneering performances of occasionally inscrutable works.